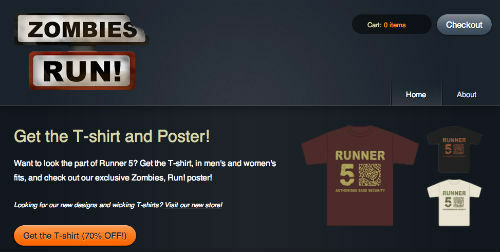 Merchandise clearance sale ongoing, new Christmas tee coming soon – Zombies, Run! We’re closing the old Zombies, Run! merchandise shop very soon – as soon as you guys buy all our stock from us, that is. There’s a very limited amount of t-shirts and posters still available with 70% off, so head on over and find yourselves a bargain. Medium and large sizes are all gone, but there are some XL and XXL available in all colours in both men and women’s fits. If you’re looking for new t-shirt designs, however, you won’t have long to wait because we’ll be releasing a special Christmas Zombies, Run! t-shirt soon – soon enough that you’ll have yours in hand to give to your favourite Runner 5 for Christmas. Or to keep for yourself! That’s also a perfectly valid option. But don’t forget our main store which is still around and fully stocked with all sorts of goodies. And there’s still plenty of time to ship things all over the world before Christmas, so check it out!